On 5th March, I wanted to do something really special or something different for Ralph. Initially, I planned to give him a birthday surprise by cooking him his favorite meal instead of relying on the typical dinner (we do this every year). My thoughts ran wild (ahem! ahem! not that wild!). Now, my effort involves cooking! Cooking a special dinner for him, including wine and a special dessert can be just the ticket to spark romance. Whoever said that the way to a man's heart was through his stomach knew what they were talking about. Moreover, I've never cooked a proper meal for anyone. So this would surely be a big surprise for him. Sadly, as many of you have probably surmised, I don't cook, can't cook. And I can't take failure on his special day. To cut a long story short, my siblings and I booked a table in a Japanese restaurant without his knowledge and celebrated his birthday. That was the surprise. Well, I guess it is time for me to embark on an adventure of cooking and embrace it as a part of my new resolution. Perhaps it is not that hard to do so. Basic idea of cooking is the willingness of playing with fire and get ready to sweaty in a hot kitchen. Oh dear... Am I really into this? It is totally a new thing for me. Anyway, I still have a long year ahead of me to practice. Besides, people say "Practice makes perfect". I hope that his next year's birthday will be different and special. I would do my very best to learn and get used to the idea of cooking. 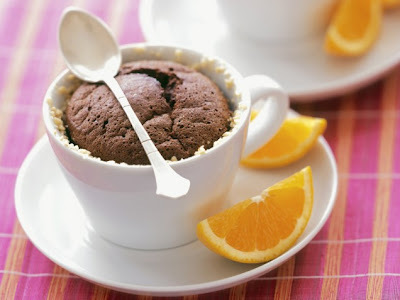 At Recipe Search I found some of the tastiest recipes and one of them is this Five-Minute Chocolate Mug Cake!!! In 5 minutes?? Wow! How can I resist seeing what this "really quick chocolate" something is? Mon.. we all love MUG CAKE!! Happy belated birthday R!!! May all your dreams and wishes come true! I don't know how to cook too! Can only cook maggi mee and pasta lah, haha!! Yea practice makes perfect Monica....go , ur man will love your willingness to learn to please him.